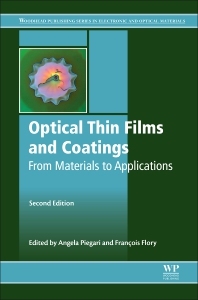 Optical Thin Films and Coatings: From Materials to Applications, Second Edition, provides an overview of thin film materials and their properties, design and manufacture across a wide variety of application areas. Sections explore their design and manufacture and their unconventional features, including the scattering properties of random structures in thin films, optical properties at short wavelengths, thermal properties and color effects. Other chapters focus on novel materials, including organic optical coatings, surface multiplasmonics, optical thin films containing quantum dots, and optical coatings, including laser components, solar cells, displays and lighting, and architectural and automotive glass. The book presents a technical resource for researchers and engineers working with optical thin films and coatings. It is also ideal for professionals in the security, automotive, space and other industries who need an understanding of the topic. Dr Angela Piegari is Head of the Optical Coatings Laboratory at ENEA (Italian National Agency for New Technologies, Energy and Sustainable Economic Development), Italy. François Flory is Professor at Ecole Centrale Marseille and performs his research at the Institut Matériaux, Microelectronique et Nanosciences de Provence, France.